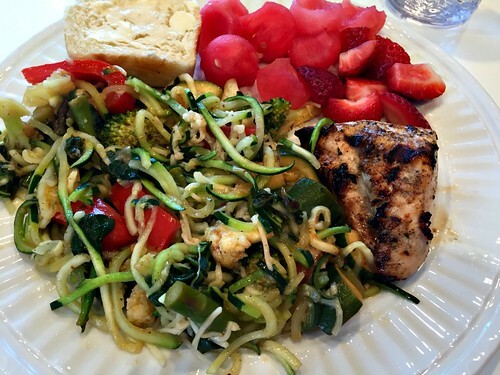 About a month ago, I mentioned that Dave and I have been enjoying zucchini noodles (zoodles) and sweet potato noodles as very low-carb, low-calorie “pasta” alternatives in many of our favorite pasta dishes — you know how much we love pasta based on ALLLLLL the pasta recipes I’ve shared over the years! I don’t think I’ve had an actual pasta noodle since the holidays AND… I truly don’t miss them! 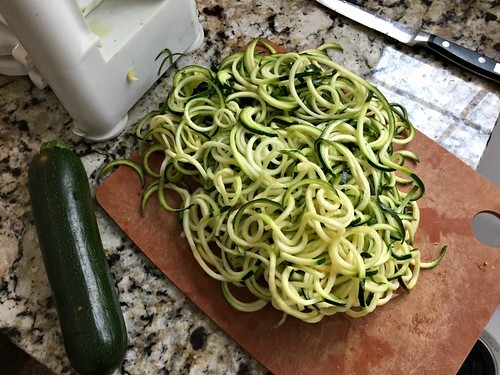 I’ve roasted thin slices of zucchini to use for lasagna noodles and I’ve used our spiralizer over and over and over again to spiralize zucchinis and sweet potatoes to replace all our favorite pastas. Zucchini and sweet potato noodles are amazingly delicious — in fact, Dave and I still can’t believe we’re eating vegetables instead of pasta! One time, I put leftovers in Dave’s lunch and he commented that the pasta was so good. He truly didn’t believe me that it was zucchini noodles! After only a few months of making and eating our vegetable noodles, I’m far from an expert; however, based on the number of emails, questions, and comments I’ve gotten regarding our spiralizer and how we use it to make vegetable noodles, I figured it was time for a post. 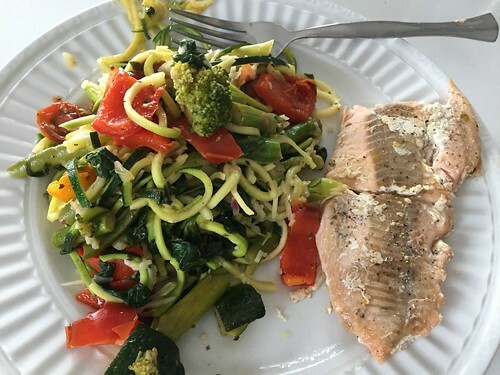 If you’ve wanted to try zoodles, but are unsure… I hope today’s post helps to answer a few of your questions and gives you the confidence you need to finally give them a try! 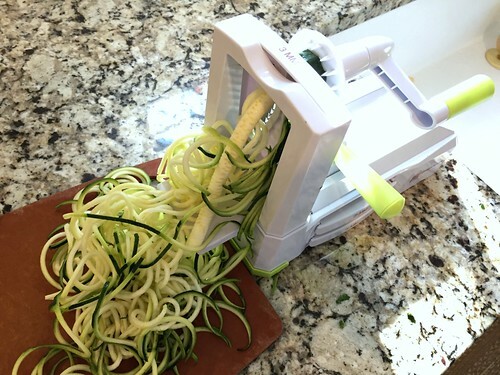 Obviously, you’ll need some sort of spiralizer if you’re going to make zoodles. 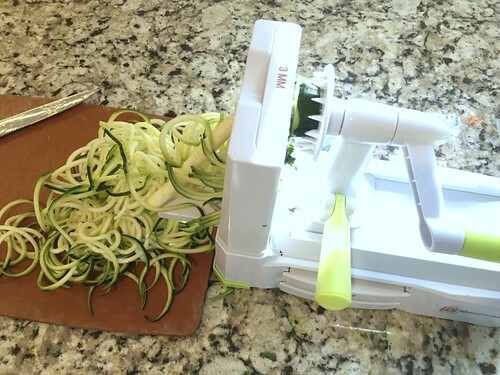 This is the spiralizer we have — we love it and it works REALLY well. There are many other smaller and cheaper spiralizers, but I had already tried my sisters and hers is very similar to this one. If you’re completely new to the world of spiralizing veggies, my advice would be to see if you can borrow a spiralizer from a friend FIRST. Either that, or buy one you know you can return just in case it isn’t a great fit for you. Then, if you really love spiralized veggies, you’ll be able to justify a more expensive spiralizer. The process of making zoodles (or spiralizing any other vegetable) is so simple… it almost feels like you’re doing something wrong! 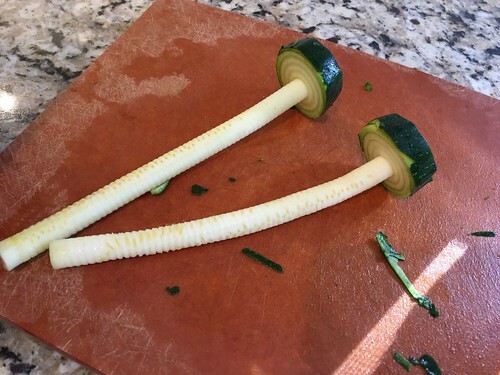 In my case, I need to cut the ends of the veggies to make each end flat. I usually put my cutting board on the opposite end so all the zoodles end up on the cutting board. This is helpful because spiralized noodles are REALLY long, so you’ll want to run through the pile of noodles with a knife or kitchen scissors before cooking them. When you’re finished, you might end up with something that looks like this. I usually just cut it up into small chunks and cook it right in with the zoodles. If you don’t like the seeds, you can just toss it. Cooking zoodles is very easy, but VERY DIFFERENT than cooking regular noodles, because you don’t boil them. All you have to do is heat a little oil or butter in a large frying pan, then sauté the zoodles in oil for 3-5 minutes, or until soft but crunchy. If you’re doing sweet potatoes or carrots, you can quickly steam them on a plate in the microwave for a minute or 2 before sautéing them. Either way, the spiralized noodles will cook down quite a bit — so make more than you think you’ll need. I usually figure on 1 small to medium zucchini per person and about 1/2 a sweet potato per person. Save time by spiralizing your veggies in advance. They will store well in covered containers in your fridge for several days. Feel free to try half zoodles and half regular (pre-cooked) spaghetti in any of your favorite pasta recipes — we sometimes do this for our kids! Speaking of your favorite recipes, you do NOT need to use a fancy Pinterest recipe with 37 ingredients to be able to enjoy zoodles. I have successfully swapped zucchini and/or sweet potato noodles for SO many of my favorite, simple pasta recipes — including straight spaghetti with meat sauce, marinara sauce, or Alfredo sauce. 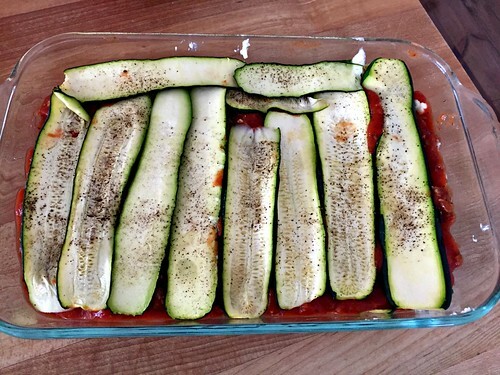 If you want to use sliced zucchini in place of lasagna noodles, you’ll want to slice it thinly and roast it for about 20 minutes first — otherwise it will make your lasagna quite watery. One of my biggest requirements when it comes to any type of healthier food is that it MUST TASTE GREAT — otherwise it’s not worth eating. I know all tastebuds are different, but I can honestly speak for both Dave and myself when I say zucchini and sweet potato noodles are amazingly delicious! Please share any of your spiralizing tips and recipes in the comments! There is no better dish than zucchini noodles. 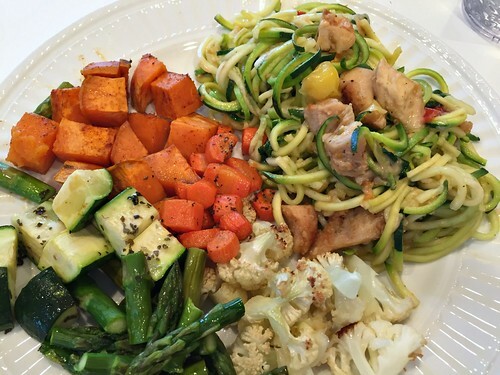 we have come to LOVE zucchini noodles with SO many of our favorite foods. Tonight, we’re eating them with a beef stew! I don’t have spiralizer. Can I do this in any other way? you could try using a zester or a cheese grater, but it will definitely be more challenging! 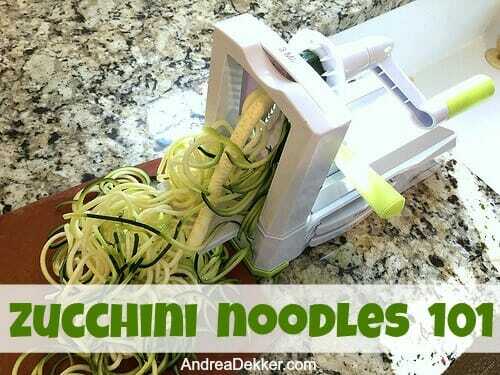 Andrea, Just spiralized some zucchini noodles for dinner tonight. My girlfriend made it for us using a hand held one but I bought one just like yours. Looking forward to experimenting with different kinds of veggies in the future. Thank you! I just found a brieftons spiralizer at Goodwill. It is very similar to yours but does not have a green handle on the side. It does have a metal one. I cannot figure out what it is for. (no instructions) What is that green knob on yours for? Also, it comes with 5 blades. One can be in the usage spot and two store on the side. How am I supposed to store the other two? Does yours have 5 blades? great find! Yes, I have 5 blades but mine came with a little caddy to store the extra blades in. I suppose you could just put them in a small food storage container so you don’t cut yourself on them. 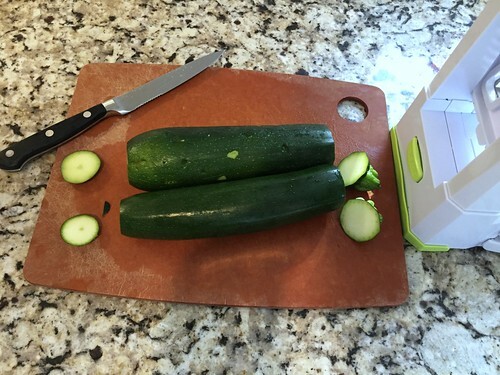 As for the green/metal handle… you’ll need to use that with your left hand to “push” the zucchini towards the blade while the right hand is cranking the handle to twist the zucchini. I think it will make sense once you start using it! Andrea, both the babies are cute! Are those your family photos? btw, Thanks for the informative recipe! I have the cheap one from WM, it was actually in the “as seen on tv” section which I normally would not shop from. It was around $20. Here is a blog that has a ton of recipes and answers a ton of questions. Some are specific to her brand of spiralizer, but most are general enough to be helpful. Thanks for that link — her recipes look great! 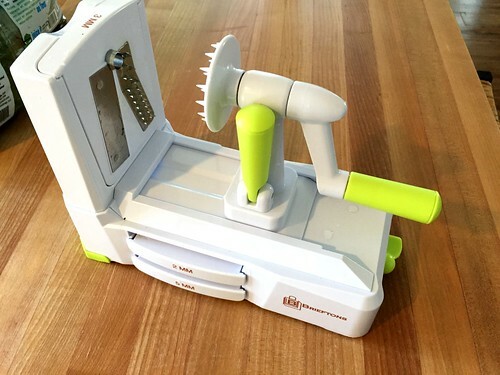 Do you use the spiralizer to cut the thin slices for the lasagna? no, I actually just cut them with a sharp knife, but I’m sure there’s a better way to do it. I don’t know if the spiralizer would work as the spiralizer cuts curly noodles — not flat. My mom makes zucchini lasagna. It’s one of the best things I’ve ever eaten. Sometimes after I spiralize zoodles, I microwave them just a short time with a little water – quickest thing ever! it IS amazing! we love the zucchini lasagna! good to know — Thanks Peggy! Right now it’s nearly 40% off. Bought one for me and for my daughter. Also peels and cores apples, peels potatoes, sweet potatoes etc. Since my grip is severely limited in one hand from an old injury I love anything that I can use electric power to compensate for my hand issue. Pros — it’s extremely versatile. Many blades and thicknesses. Additional super thin blades purchase separately. Provides entertainment for little ones. Cons — box is kinda big as in super big but it holds all the parts and pieces which is good because they are sharp. Price may put some people off. I bought mine on sale but the amazon price today is the lowest I’ve ever seen it. As for any product recommendations, read all the reviews. If you are not sure if this is something you will use several times a week, I’d suggest the handheld one first, especially if storage is an issue. It’s smaller than a soda can. If you bake a lot AND own a Kitchen Aid mixer already the attachment is a fantastic addition for slicing fruit, or veggies for casseroles. I have a meat grinder attachment for making ground meats and I have a pasta attachment I never use unless making homemade pasta. If you are really really into a wheat free lifestyle I really like the one Andrea has. I would have purchased that one but I had the stand mixer already. Thanks for the reviews and recommendations! I made zoodles a little while ago, here is how I cooked them. I cooked 3 slices of bacon until crisp, wiped the grease out of the pan, added 1tbl each of butter and olive oil and added about 1/2cup of diced onion, salted until softened, added the zoodles (3 smaller zucchinis) and sauted the noodles for about 3-5 minutes. Added a few sprinkles of Italian seasoning, and some salt and then crumbled the bacon on top, a good sprinkle of parmesan cheese, and it’s ready to serve. Before there was zoodles, I have made this with just slicing the zucchini in circles, also added some yellow summer squash sliced. This is almost the exact “recipe” I’m planning to share in a couple weeks. It’s my most simple, go-to zoodle recipe that I can whip up in a flash. I often add leftover grilled chicken to the mix as well! SOOOOOO good! I made zoodles recently in an effort to eat fewer carbs. I cooked them with my normal homemade spaghetti sauce and the whole thing was so watery! 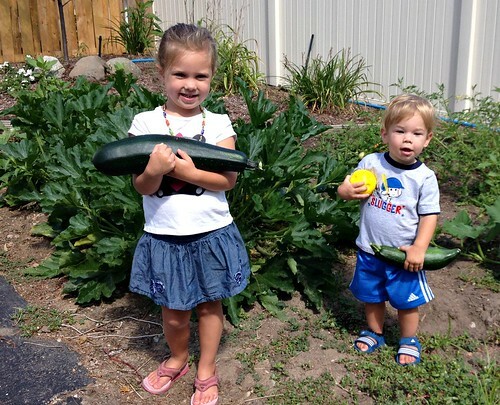 What do you do to the zoodles to keep them from watering everything down? Or is this just something I’m experiencing? We’re gluten free so we’ve been there, trust me. Here is my solution. Once you have you noodles add a big glop of good olive oil to a large shallow sauté pan and gently cook them until the water boils off. The oil keeps them from sticking. I may add that we have zero Teflon and are a soy free family so we need an attack plan to preventing sticking. My question, too, was about zucchini being such a watery vegetable, and how it would not be watering down sauces and sitting on the plate in a watery mess, which we hate! I guess the answer is to try it, right? Not sure we would like the sweet starchy taste of sweet potatoes in pasta recipes, but maybe you don’t taste the sweetness so much?? yes, the sweet potatoes are sweeter, but not too starchy for me (after all, pasta is very starchy too!) As for the wateriness, just make sure you don’t cook them too long (only 3-5 minutes). Give it a try (or maybe a few tries) you might be surprised how yummy they are! Thanks for the tip! I’ll try that, along with shortening my cook time. my first suggestion would be to not “cook them with the sauce”. I’d suggest having the sauce ready to go in a separate pan, then sautéing the zoodles quickly (3-4 minutes) putting them on your plate, and topping them with the sauce. If you cook the noodles too long, they will get watery, so shorten up the cooking time and keep the sauce separate until it’s time to serve. Hopefully that will help! I didn’t cook them in sauce. Not sure why I said that! But I did probably leave them on too long. I’ll give it another shot soon. Yours looks yummy! oh good, we really do love our spiralizer!! Hope you love it too! wow — good for you. I’m not sure I’d ever be cut out for a Whole 30 (we LOVE dairy) but we do love eating lots of veggies! Congrats on baby #5! Thanks for this post! I’m looking forward to recipes! My family loves your savory sausage pasta bake recipe. I have always used lentil noodles instead of regular pasta. No one notices the difference. Now I’m thinking of trying the zucchini noodles and just topping with that sauce/meat and sprinkling cheese over top. Can you successfully freeze home made zoodles? Thanks! 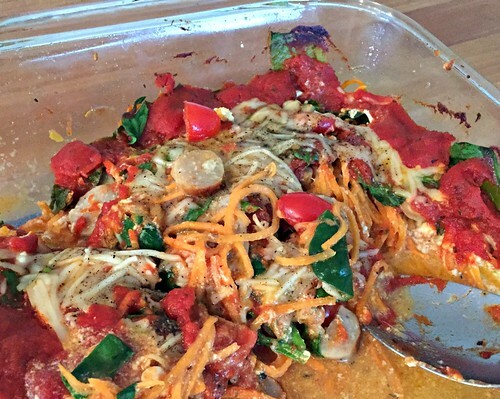 I personally haven’t tried freezing the noodles, but another reader said you could! You can also buy zoodles in the frozen food section. I tried those (cooked in the bag in the microwave) with spaghetti sauce last weekend and they were fantastic. I don’t even like zucchini! But frozen is a good (though expensive option) if you just want to try them. yes, I thought I even mentioned that in the post, but it looks like I might have forgotten to say that! I’ve seen the prepackaged zoodles in the refrigerated produce sections too! I second the request for recipes! I’d like ones that aren’t tomato based since tomatoes trigger migraines for me. Thanks to everyone in advance. Yay! I am glad to hear this! My husband won’t eat anything tomato-based, so I cannot make the majority of your pasta recipes unless I want to eat it all myself… I look forward to your zoodle recipe! When I was trying out zoodels I would use a veggie peeler to get a giant strip (like your lasagna noodles) and then a knife to get it into thinner strips. oh that’s smart! It probably takes you quite a bit longer than using a spiralizer, but would be a great alternative for someone just wanting to try it out!